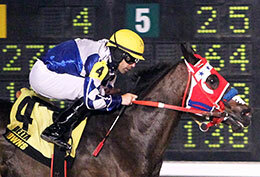 Jw Who Dat will head six other entries in Saturday’s 870-yard, $30,000 Races and Aces Stakes at Evangeline Downs. OPELOUSAS, LA—OCTOBER 31, 2018—Seven distance specialists, headed by Fernando Ramirez’s JW Who Dat, have been entered in Saturday’s 870-yard, $30,000 Races and Aces Stakes at Evangeline Downs. A 6-year-old son of Agouti trained by Eric Palacio, JW Who Dat has earned $72,700 from eight starts this season, and his four 870-yard stakes wins this year include a 2 1/4-length victory as the 11-10 favorite in the September 1, $25,000 Faubourg St John Stakes (R) at Fair Grounds Racecourse. The gelding drew post 6 and will be ridden by Antonio Alberto. Other contender include No Politics Here, a 4-year-old Jess Louisiana Blue gelding who will be making just his second start at the distance off of a second-place finish to JW Who Dat in the Faubourg St John. Trained by Kenneth Roberts Sr. for owner T M Ranch, No Politics Here drew post 7 and will be ridden by Randy Edison. All Evangeline Downs races can be seen at Q-RacingVideo.com.